The best app to send e-cards to the one you love! Share addresses, cards and more with your friends! Send a real card by post or an ecard to Facebook, Twitter or another MailMe! user. MailMe! lets you share your address with your friends and keep up to date when their addresses change. 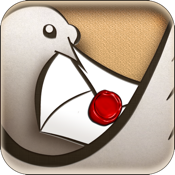 MailMe! also enables you to generate personalised cards that can be sent by post, email, Facebook, Twitter or directly to another MailMe! user. Create fantastic Valentine cards, Birthday cards, invitations and special messages. This is a three-in-one app that keeps your addresses updated and let's you create both real and virtual cards. SHARE YOUR ADDRESS WITH YOUR FRIENDS. HAVE UPDATED ADDRESSES FOR YOUR FRIENDS. PRINT BEAUTIFUL POSTCARDS AND ENVELOPES. DOWNLOAD THEMED POSTCARD PACKS FOR FREE. MailMe! allows you to easily and securely share your address with your friends. It enables you to be up to date with your friend's latest address any time you want to visit or contact them. All you need to do is register an account on the MailMe! network, and start inviting your friends to join you. You can access your friends' addresses even when you are not online. You can share up to four different addresses as well as colourful post-it notes. A powerful postcard editor allows you to add layers of texts with different styles, fonts and colours. You can also insert your own photos and apply various frames. You can print the cover and inside of the card. MailMe! saves you time by letting you easily print addressed envelopes at the tap of a button. MailMe! provides you with an online collection of themed card packs and allows you to download as many as you like without any extra cost. More and more postcard packs will be available for free as we constantly create new ones with different themes.